The Chesapeake Bay extends 200 miles and encompasses a large geographical area in Maryland and Virginia. This map shows the entire region. The Chesapeake Bay Bridge on the northern end provides access between Annapolis (Sandy Point) and the Maryland Eastern Shore (Stevensville). On the southern end of the Bay, the Chesapeake Bay Bridge-Tunnel connects Virginia's Eastern Shore with the Virginia mainland at Virginia Beach near Norfolk. The Chesapeake Bay offers a wide range of recreational activities such as fishing, crabbing, swimming, boating, kayaking, and sailing. Some of the region's most popular getaway destinations are along the Bay. There are thousands of tributaries that send fresh water into the Chesapeake Bay and offer a vital habitat to aquatic animals and plants. These creeks, streams, and rivers also provide people with public access points to enjoy outdoor recreation. The Potomac River runs over 383 miles from Fairfax Stone, West Virginia to Point Lookout, Maryland and flows into the Chesapeake Bay. The river is the fourth largest along the Atlantic Coast and has many creeks and streams that flow into it. The Potomac offers many recreational opportunities around the Washington DC area and has multiple access points within the capital region. The Patuxent River is a tributary of the Chesapeake Bay that bisects the western shore of the State of Maryland north to south. The River is home for more than 100 species of fish, including bass, catfish, chain pickerel, and bluefish. The Patuxent Water Trail winds through seven counties in Maryland. Patuxent Riverkeeper operates a paddling visitor’s center at 17412 Nottingham Road; Upper Marlboro, MD. The center rents kayaks and canoes and gives tours along the River Trail. The Rappahannock River runs for approximately 184 miles from the Blue Ridge Mountains in the west to the Chesapeake Bay south of the Potomac River. The Rappahannock offers one of the most scenic and best-protected river corridors in the Chesapeake Bay watershed. North of ​​Fredericksburg, the river provides excellent opportunities for canoeing and kayaking. Friends of the Rappahannock is a non-profit conservation organization dedicated to protecting and maintaining the water quality and scenic beauty of the river. The York River is a 34-mile estuary located east of Richmond that drains into the Chesapeake Bay towards the southeast, entering the bay approximately 5 miles east of Yorktown. The only crossing of the river is the George P. Coleman Memorial Bridge, a swing-type drawbridge which carries U.S. Highway 17 between Yorktown and Gloucester Point. The James River is Virginia’s largest tributary to the Chesapeake Bay, flowing across the entire state from its beginning in Bath and Highland Counties and ending in Hampton Roads. The James is Virginia’s largest river. It is 340 miles long, which makes it one of the longest rivers in America that begins and ends in the same state. The Watershed is comprised of three sections. The Upper James Watershed begins in Allegheny County and travels through the Allegheny and Blue Ridge Mountains until Lynchburg. The Middle James runs from Lynchburg to the Fall Line in Richmond, while the Lower James stretches from the fall line in Richmond to the Chesapeake Bay. The James is home to one of the largest and busiest harbors in the world at Norfolk. The Susquehanna River is 464 miles and the longest river on the East Coast that drains into the Atlantic Ocean. The Susquehanna rises and flows through New York, Pennsylvania, and Maryland into the Chesapeake Bay. The Susquehanna River Water Trail offers recreational activities including fishing, boating, birding, and hiking along scenic vistas. The Patapsco River is a 39-mile-long river in central Maryland which flows into the Chesapeake Bay. The tidal area of the Patapsco is crossed by the Baltimore Harbor and Fort McHenry Tunnels as well as the Francis Scott Key Bridge. The river is managed as a put-and-take trout fishery through nearly 10 miles of the Patapsco Valley State Park. Recreational opportunities include hiking, fishing, camping, canoeing, horseback, and mountain bike trails. The Severn River runs 14 miles through Anne Arundel County, with its headwaters in Gambrills and its entrance into the Chesapeake Bay in Annapolis. The towns of Severna Park, Sherwood Forest, Arnold, Herald Harbor, and Annapolis have easy access to the river for swimming, boating, and fishing. 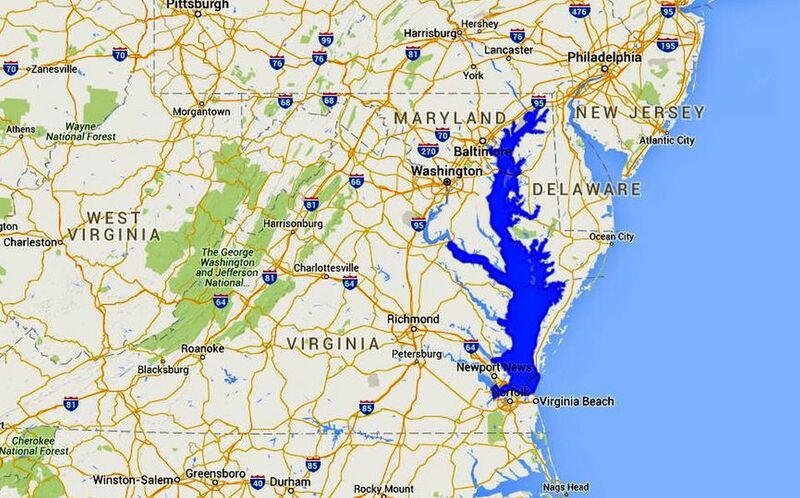 The Chester River is a major tributary of the Chesapeake Bay. It forms the border between Kent County and Queen Anne's County, Maryland, with its headwaters extending into New Castle County and Kent County, Delaware. It is located south of the Sassafras River and north of Eastern Bay and is connected with Eastern Bay through Kent Narrows. The Sassafras River is about 22 miles long and starts in western New Castle County, Delaware, and along the boundary between Cecil County, Maryland on the north and Kent County, Maryland on the south. It is south of the Elk River and north of the Chester River. 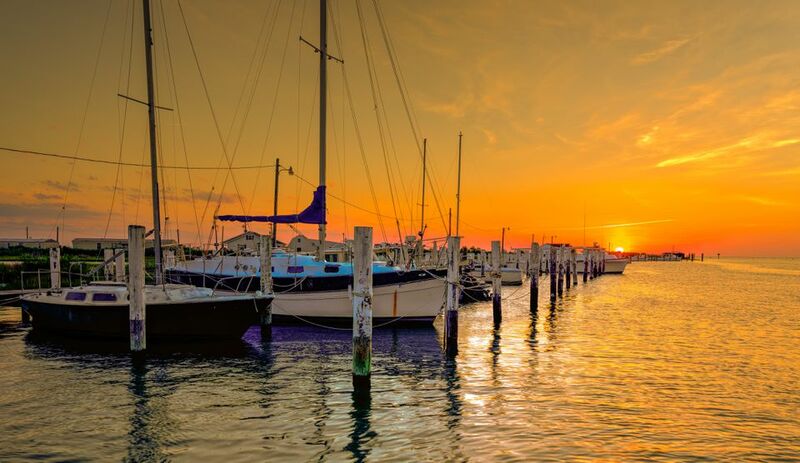 The Sassafras River is home to many boats and four large marinas, all of which near Georgetown, Maryland. The Choptank River is a major tributary of the Chesapeake Bay and the largest river on the Delmarva Peninsula. Running for 71 miles, it rises in Kent County, Delaware, runs through Caroline County, Maryland and forms much of the border between Talbot County, Maryland on the north, and Caroline County and Dorchester County on the east and south. The Hyatt Regency Chesapeake Bay Golf Resort, Spa & Marina is situated on the east shore in Cambridge, MD. The 64.3 mile Nanticoke River rises in southern Kent County, Delaware, flows through Sussex County, Delaware, and forms the boundary between Dorchester County, Maryland and Wicomico County, Maryland. The tidal river course proceeds southwest into the Tangier Sound, Chesapeake Bay. A 26-mile ecotourism water trail running along the River continues on to a 37-mile water-trail extending through Maryland to the Chesapeake Bay. The Pocomoke River stretches approximately 66 miles from southern Delaware through southeastern Maryland. At its mouth, the river is essentially an arm of Chesapeake Bay, whereas the upper river flows through a series of relatively inaccessible wetlands called the Great Cypress Swamp. The Wicomico River is a 24.4-mile-long tributary of the Chesapeake Bay on the eastern shore of Maryland. The river is one of two in Maryland with this same name, along with the Wicomico River (a tributary of the Potomac River) in south-central Maryland.